I’ve been posting a lot about Fantasy Kingdom XXI, but not very much about what went into writing Ella and the Panther’s Quest. That’s because a lot of the topics I wrote about Fantasy Kingdom XXI would contain spoilers for Ella. I was going through some old pictures and I finally found something spoiler free. 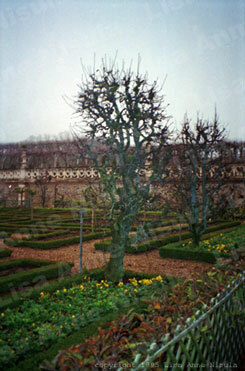 These are pictures from the gardens at the Chateau de Villandry near Tours, France. 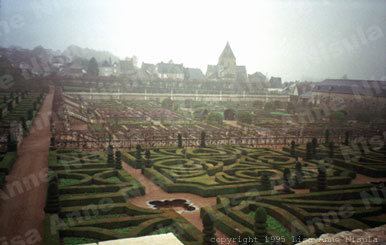 These were the gardens I used as the basis for the gardens in the book. 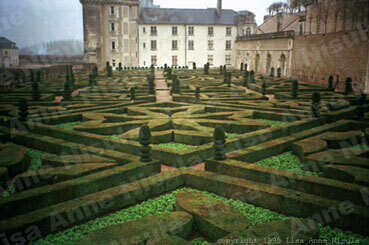 You have to imagine the hedges as being taller in the book, but the layout is similar. The picture below would be similar to what Ella sees from the window, only with a forest in the background instead of the town. If I remember correctly, the closer part of the garden in these pictures, with the small topiary trees, is called the Love Garden. 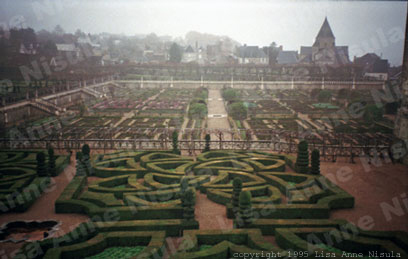 Each little hedge area represents a different kind of love, a very French Renaissance kind of garden. The part you can see in the distance that’s set out in a series of squares is the vegetable garden. It was October when I visited, and very rainy, which is why the pictures all seem to have a mist over them.